If you're a regular reader of mine, then you're probably sick and tired of hearing about my holy grail primer aka the Hourglass Veil Mineral Primer. Well, today my favourite primer is sharing the spotlight with a product that everyone claims to be a dupe for, the NYX Angel Veil Primer. A lot of people have told me that these were basically the same thing, so I of course got curious and decided to put them against each other for myself. When it comes to the packaging, the Hourglass primer definitely takes the cake. It just looks and feels much more luxurious. It's surely not made from cheap materials as the bottle is a frosted glass that's on the heavier side. It also has a pump, which is a plus for me. As for the NYX primer, it's in a squeeze tube. But something I really like about it is the pink cap that has a sort of metallic look to it. In my opinion, that gives it a little more oomph, making it look less cheap-looking. Regardless, the one with better packaging is the Hourglass Veil Mineral Primer. If you get out a dollop of both primers, they'll look almost identical. However, you do see and feel a difference once you start rubbing them in. I noticed that the NYX primer has a much more lotion-like consistency, while the Hourglass primer sort of just turns into a smooth nothing. The HG primer melts into my skin in no time and leaves my skin feeling super smooth and ready for makeup application. The NYX primer also has that end result, but it takes a longer time and a bit more effort to rub in the primer. Bottom line, I prefer the Hourglass Veil Mineral Primer's formula over it's competition. This is where the primers show a complete opposite. I alway buy the 0.33oz bottle when it comes to the Hourglass primer (which is probably why I always run out so quickly) but since the NYX primer comes with 1.02oz, we'll compare it with the next size up of the Hourglass primer - 1oz. The Angel Veil rings in at $18CAD. Pretty pricey for a 'drugstore' primer but it's nothing compared to the price of the Veil Mineral, which comes in at a whopping $63CAD. That is 3.5 times more than the NYX primer. And if you didn't realize, you still get an extra .02oz with the NYX primer. It's safe to say that NYX Angel Veil Primer takes the cake price wise. Like I mentioned earlier, the NYX primer takes a little longer to work into the skin compared to the HG, but when they're on they have the same effect. They both smooth out your skin and even mattifies it, giving you a perfect base to apply foundation on. After putting on foundation, they still have the same effect. I actually wore each on both at the same time, one on each side of my face. Even up close (like an inch from the mirror close), I couldn't tell the difference, they looked exactly the same on both sides. It's a definite tie when it comes to the wear test. 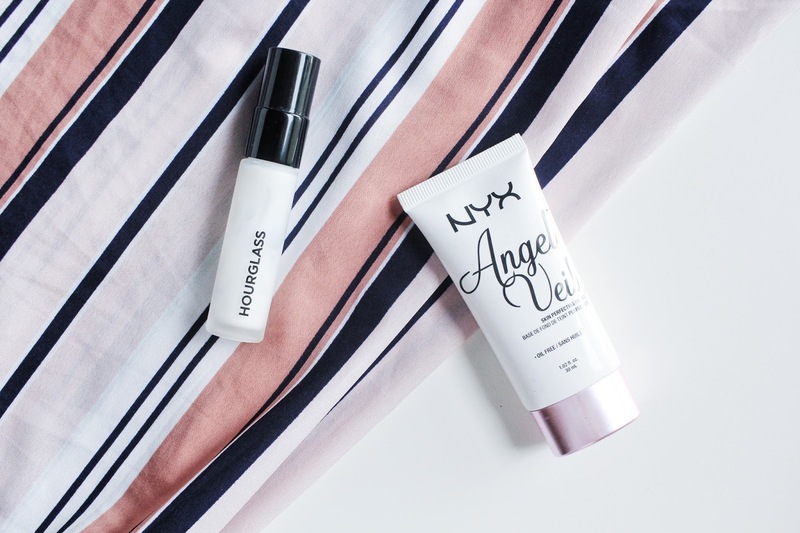 I am pleasantly surprised by the NYX Angel Veil Primer and how well it stood up against my holy grail, Hourglass Veil Mineral Primer. Overall, I think the NYX primer is an amazing alternative if you can't justify spending so much on the HG primer. They both have the same results, so you're definitely not missing out on anything if you can't get your hands on the Hourglass one. But if you are feeling lavish and you want to splurge on a primer, get yourself the pricier one. Either or, they're both amazing and do the same thing. As for me, I'll try to limit myself from using my HG primer, since it's so expensive, substituting it with the NYX primer. Though, I don't think I'll ever stop repurchasing my holy grail primer. Have you tried any of these primers?